A wooden honour roll commemorates those from the Shire who served in World War One. 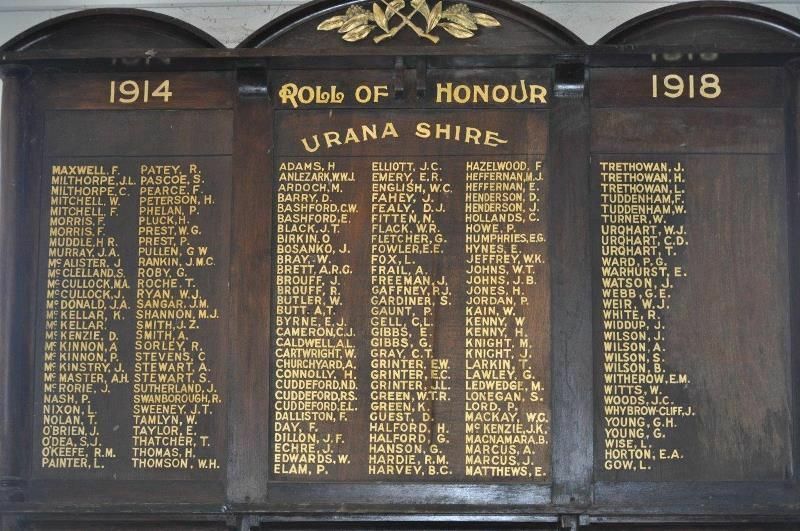 The unveiling of the Honor Roll of the Urana Shire took place at the Shire Hall on Tuesday last week before a fairly large gathering of the public. The Shire Engineer had a large awning erected in front of the chambers, and a good number of seats provided. The Councillors were all present, and were seated in the lobby, which acted as a platform, and with them were seated Mrs Macknight (who unveiled the Honor Roll), Dr. Macknight and Mr M. Kilpatrick, besides the Council's officials. The Roll which was veiled with a large Australian Flag, contained the names of over 180, with a good many more to be added.